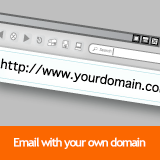 With Thexyz Webmail you have the choice of using your own domain or one of our domains. Using your own domain offers more features and benefits than using one of ours. I am going to list some of the reasons in this post to show you how the $14.95 per for a domain is well worth it. When you use your own domain for Thexyz Webmail, you also get access the the admin area which enables additional features such as unlimited email aliases. You can also change your email address and edit your password yourself. When using your own domain with Thexyz Webmail you also get a free hosted SharePoint site which includes 250MB of storage. This storage can be upgraded as needed. When you use ‎your own domain, you also have the option to upgrade to use your own branded webmail site. This will let you use your own logo on login and webmail pages, you can also add notifications and messages to webmail. A great way to add notifications to all members of your domain. Using your own domain also adds the option to use webmail chat. Using your own domain with a custom webmail site adds a secure instant chat feature directly to webmail. This way you can chat instantly with other members of your domain. Unlike when you use your email account with the domain of your ISP or with free email providers. You are not tied down to using one service with your own domain. This means that can migrate your email service from different providers. Hi, all your information about email hosting and its benefits is considering for a big company like they have 50 or more employees. If I have a small company, then can I buy an email hosting plan for my business.